Premium Heavy Duty Dry Vac Systems are the same as Model 6297 and add either a 30, 55 or 110 gallon drum. Compressed air, normally 80-100 PSIG (5.5 - 6.9 BAR), flows through the inlet (1) into an annular plenum chamber (2). It is then injected into the throat through directed nozzles (3). These jets of air create a vacuum at the intake (4) which draws material in, accelerates it through the unit (5), and directs it to the bottom of the drum. The airflow exhausts through the port in the drum lid. Airborne particles are trapped by the filter bag (6). The Heavy Duty Dry Vac unit (5) and vacuum tools are built to withstand rugged use. 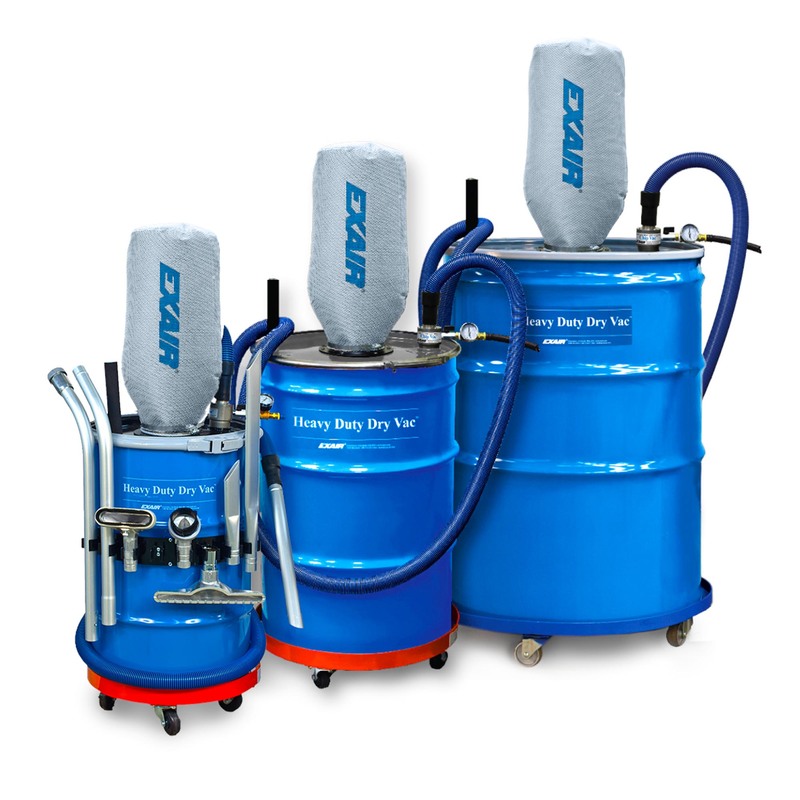 EXAIR's Heavy Duty Dry Vacs comply with OSHA's Safety Requirements, the EU General Product Safety Directive (2001/95/EC) and meet the noise limitation requirements of the EU Machinery Directive (2006/42/EC). All sound level measurements are taken at 3 feet away. The standard Heavy Duty Dry Vac is good for heavy dry cleanup and transfer. 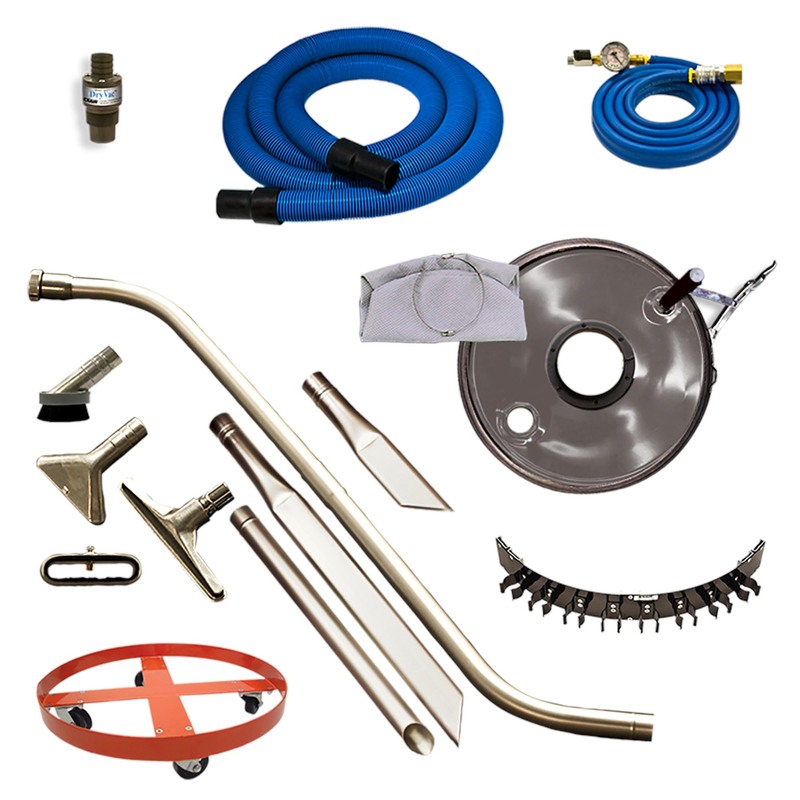 It includes the Heavy Duty Dry Vac vacuum, lever lock drum lid, auto-safety shutoff valve, filter bag, 10' (3m) of polyethylene static resistant vacuum hose at 1-1/2" (38mm) I.D., hose hanger, 1/2 NPT quick connect couplings, 20' (6.1m) compressed air hose with swivel fitting, pressure guage and aluminum chip wand. Deluxe Heavy Duty Dry Vac System improves on the Heavy Duty Dry Vac by adding features that make it easier to use for everyday tasks. It includes everything that comes with the Chip Vac and adds a drum dolly, heavy duty aluminum tools (2 piece double bend wand, 12" (305mm), floor tool, 11" (279mm) crevice tool, 24" (610mm) crevice tool, skimmer tool with detachable brush, tool holder, and a 3 1/2" (89mm) diameter dust brush with conductive bristles. 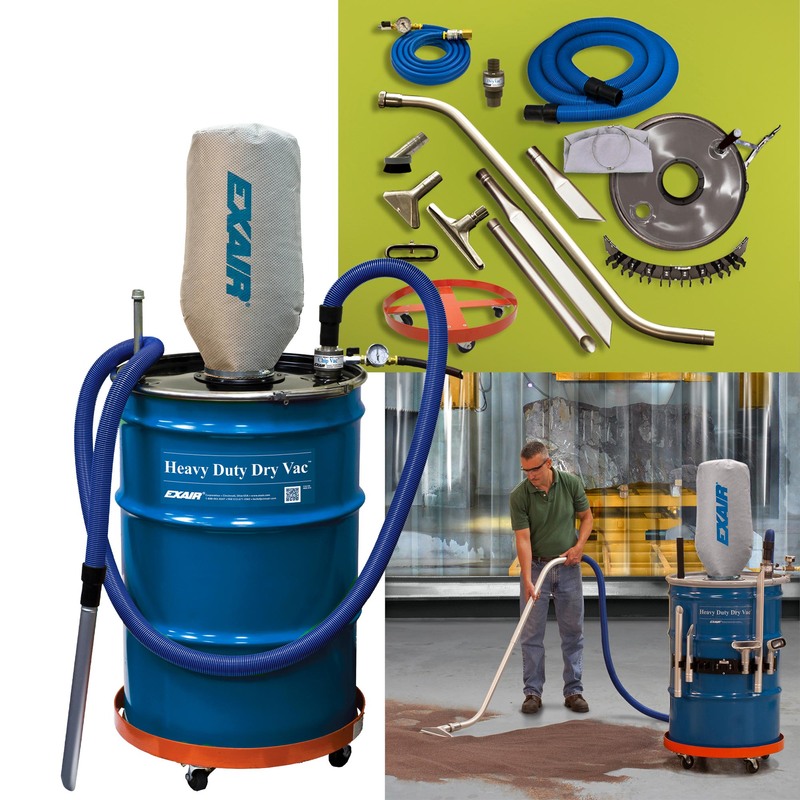 The Premium Heavy Duty Dry Vac System upgrades your Heavy Duty Dry Vac system all the way by adding a 30, 55, or 110 gallon drum to the Deluxe Heavy Duty Dry Vac System. Heavy Duty Dry Vac vacuums up abrasive garnet from the work surface surrounding a vibratory bowl used to deburr parts. Sand that covers the floor around a sand blaster is quickly vacuumed into the drum using the rugged floor tool. The Heavy Duty Dry Vac cleans up a spill of tumbling media. The Model 6197 Heavy Duty Dry Vac System includes 10' (3m) static resistant hose, 20' (6.1m) compressed air hose, filter bag, aluminum chip wand, shutoff valve and gauge. Heavy Duty Dry Vac are available in 30, 55 and 110 gallon sizes. 110 Gallon Heavy Duty Dry Vac provides maximum capacity cleanup for a large, dusty walnut shell blasting application. Model 6297 Deluxe Heavy Duty Dry Vac offers all the tools and accessories to clean up abrasive and heavy material spills.